I'm Matt Clark. I live to Connect, Create and Communicate. I am a Family-Man, Creative Guru and Spiritual Misfit. Matt Clark strives to build bridges with others through relationships and common ground. Relationship matters. Matt Clark will work with your organization to establish a consistent and creative brand/identity. Matt Clark provides visual design through print collateral from A to Z. Need a corporate logo? identity? brochure? custom sales piece? direct mail? stationery? billboard? vehicle wrap? Social Media designs? Matt Clark can provide the missing ingredient that your company needs. 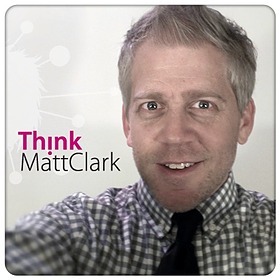 Matt Clark creatively brainstorms with you to make you look great! Matt Clark feels the need to bring life to events, ideas, a lesson or a discovery through storytelling truths. Events are static and Matt Clark wants to energize them through the spoken word. o After completing 2 week speaking gap, Elders asked to serve as interim, then Pastor. o Preached weekly sermons. o Contributed input to Elders for future direction. o Oversaw outreach community events. o Oversaw Children's Ministry & weekly KidQuest Production. o Wrote weekly script and directed cast for KidQuest Production. o Coordinated & Planned Student Ministry studies and events. o Created church-wide brand identity and all creative communications. o Developed relationships & connections with students K-12th grade. o Actively Mentored Middle School Students. o Taught weekly messages/studies. o Developed student-led leadership for Middle School students. o Partnered with other youth minister to search, create, re-model, and oversee "The Grind" (student center) o Developed, designed and implemented an offsite, community-focused, activity center for teens. o Director of Lake Aurora Christian Camps. o Recruit, Led and Organized adult volunteers to serve as mentors. o Oversaw 6th-12th grade Bible Studies and Youth Events. o Led worship & games. o Created mid-week gathering. o Oversaw 6th-12th grade Bible Studies and Youth Events. o Led worship & games. Providing your business, organization or church with complete identity. From logos to brochures, from direct mail to event material, from slides to stationery... we'll provide the right CREATIVE for you. Family, Creativity, Ministry, Connecting, Speaking, Service, Intentional Living, Authenticity.